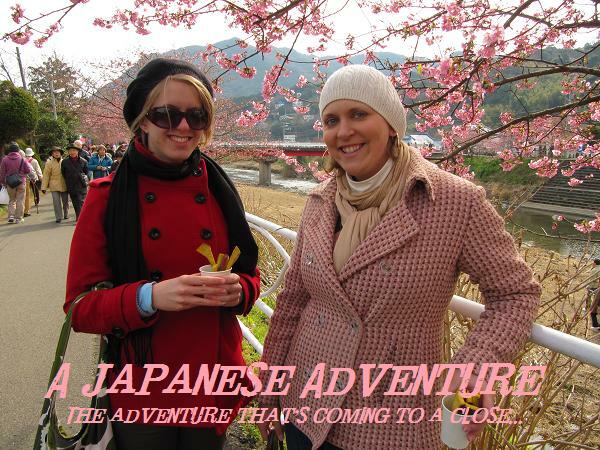 A Japanese Adventure: Over Three Months?! Last week I did a home stay in Kakegawa, a city in my prefecture. There was a festival going on and the international office organizes home stays for ALTs every year. I was put with an amazing family! We had a big welcome party with WAY to o much food. Then we walked around the festival, which had a bunch of different artsy things displayed along a long stretch of road. There was pottery and paintings and much much more (including "learning" how to play the Japanese harp...notice me laughing at how terrible I was considering I couldn't read the Kanji to play it!). Then I went and hung out with my host mom for awhile, the first test of my bad Japanese and her bad English. It worked out, thanks to the few pictures I brought of my family and close friends. We then went out for some traditional Japanese Izakaya, where the food and drinks just kept coming! It was me and 3 other ALTs and the four host families. It was a good time, although I had way to much to eat! The whole weekend was seriously food, food, food!!! I hung out some more with my host fam after that, and in the morning we went to the onsen and out for lunch. The onsen is quickly becoming one of my favorite things about Japan, especially cuz I live in the land of hot springs! It’s like having 30 hot tubs in one place, some with bubbles, some without, some with waterfalls, some with places to lay down, some with tea and extra goodies for your skin. So relaxing! Overall, the homestay was great. It was good for me to start trying to communicate in Japanese a little, cuz I really don't get the opportunity at school - they just always have one of the English teacher's help me or translate things to me. I really enjoyed seeing how a family lives here, considering I live alone and in subsidized housing! My family has three cats, plays a lot of tennis, goes to the country club (it seems quite frequently haha), and have three children. Good weekend. The biggest news of my life right now is that I am getting a car. Like actually getting it after all the talking and deliberating and waiting! Less than two weeks now. I test drove it during my homestay (the car dealer is in the same city) and things went okay (well I stayed on the left side of the road anyway haha) except for the stupid blinker is on the right and the windshield wipers on the left. So naturally, I turned the wipers on every time I went to turn on the blinker. Old habits die hard, and I’m sure I will be a terrible driver when I get back to the US and everything changes back again! I am waiting to pick up the car til I go down to Kakegawa again (since it’s a bit of a hike, I gotta take advantage of my school paying for my business trip in two weeks and drive it home then). My friend Dion graciously agreed to ride back with me, manning the maps and probably gripping on for dear life since it will be my first time on the open road! It’s mostly the same highway all the way back though, so I think we should be good to go :) The car dealer was a little worried about me haha driving so far the first time, we'll all cross our fingers. So on that note, here's a picture of my car, and a dedication to the hill I ride up everyday :) It was remarkably beautiful today, so I had to stop and take a pic. It's not a great pic, but the sun was hitting perfectly as the sun set and Fuji-San was a brilliant red color. 8 more times biking up that stuipd hill :) But hey, who's counting? Can you actually fit in there?